Montepulciano is famous for not just one but two excellent wines, Vino Nobile di Montepulciano and Rosso di Montepulciano. However, it is often underestimated in terms of the interest of its art and architecture, perhaps because of its small size. In fact, in former times its citizens held their city to be on a par with Sienna, and indeed Montepulciano is packed with interest and charm and a must see for visitors to Tuscany, Italy. Montepulciano, located in the Val di Chiana of Tuscany, Italy, within easy reach of the Val d'Orcia, is one of the most attractive hills towns in Tuscany. It is built on a ridge of Monte Poliziano in the province of Sienna in Tuscany. It is the ancient Etruscan city of Nocera Alfaterna, which in 308 B.C. made an alliance with Rome against the Samnites. In the Middle Ages it was under the control of Florence, but was conquered by Sienna in 1260. The main street of Montepulciano stretches for 11.5 kilometers from the Porta al Prato to the Piazza Grande at the top of the hill. The cathedral was built in 1619, from plans by Scalzo and until the 18 C it held the tomb of Bartolomeo Arragazzi, secretary of Pope Martin V, a work of Michelozzo. The church of the Madonna di San Biagio was planned by Antonio da Sangallo (1518-37). The façades of the church of Saint Agostino and of the Oratorio della Misericordia are worth seeing. Notable among the civic buildings are the Tarugi palace, like the Mercato, a work of Pignola, the Contucci palace designed by Sangallo and the fourteenth-century Palazzo Municipale, which contains a small gallery of Sienese and of Umbrian art. The most famous men of Montepulciano are Cardinal Bellarmine, Pope Marcellus II, Cervini, Angelo Ambrogini, better known as Poliziano (1454-1494), and the humanist Bartolomeo of Montepulciano. St. Agnes of Montepulciano died in 1137. For your wine vacation in Chianti - stay at a winery - it costs less than a hotel and is infinitely better fun. Check our Greve in Chianti agriturismo web site. The castle of Montepulciano was first mentioned as a fortified centre in a document of 715. Following the decline of the Carolingian dominion, the Scialenghi and Manenti da Sarteano families became pre-eminent, but by the 12 C the free municipality was emerging, at first allied with Sienna. At the beginning of the 13 C, however, the inhabitants allied themselves with the Florentines to counteract the rising power of Sienna and in the hope of maintaining some level of independence. This was the beginning of a long contest between the Sienna and Florence for the possession of Montepulciano. Sienna was defeated in 1208, and hence in 1229 allied itself with the ancient feudal Lords who had been expelled from Montepulciano, and attempted to regain control. Sienna was initially victorious over Florence and in 1232 razed the wall and towers of the castle of Montalcino. However, the course of the conflict soon turned against them and they were forced to pay the amount necessary to rebuild Montepulciano. After the battle of Montaperti in 1260, the castle fell to Sienna but after the battle of Benevento, fell into Florentine hands again. With the ascendancy the Guelfs in Sienna (1287) and coming of a period of relative peace between the two cities, Montepulciano started a long period of dependence on Sienna, extending until almost to the middle of the 14 C. During this period, Montepulciano reinforced the municipal institutions but was also divided internally by the struggles between the districts and power groups. The family Del Pecora assumed particular importance during this period. In 1390, Montepulciano passed once again under the sovereignty of Florence which restored the walls and constructed a new fortress. At the end of the 15 C, the inhabitants, for economic reasons, again attempted to ally themselves with Sienna, but after a period of diplomatic treaties the Florentines reconquered Montepulciano definitively in 1511. In 1561 Montepulciano was raised to an Episcopal Seat and in that year also drew up a new municipal statute. From 1609 to 1637 Montepulciano and all its territory became a fife of Cristina di Lorena, widow of Ferdinando I, and fell under the direct jurisdiction of the Grand Duchy. More about Vino Nobile di Montepulciano. 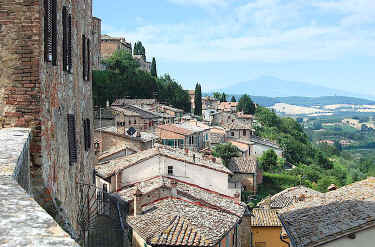 Specialising in Montepulciano, Montalcino and Chianti wine tasting tours. 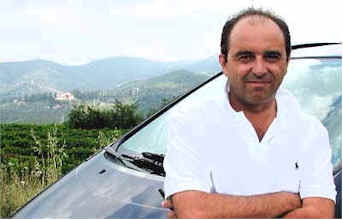 Giovanni Sirabella, a licensed tour guide and driver, will share his wine knowledge with you during whole day wine tours by air-conditioned minibus during your visit to Tuscany. 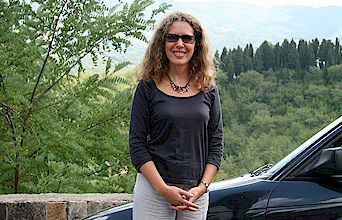 Angela Saltafuori, a native Tuscan and licensed sommelier, will guide you on enjoyable and interesting whole day wine tours by air-conditioned minibus during your visit to Tuscany. Angela Tuscany wine tour guide. Vorresti pubblicizzare la tua attività su questo sito web per Montepulciano e ricevere traffico in entrata dalla nostra rete di più di 50 portali relativi? Clicca qui per ulteriori dettagli in merito alla nostra soluzione integrata per una presenza su internet piena di successi. For a complete range of hotels throughout Tuscany, click here.